38570 Stocking Dish - in ready to..
AC-228 Large Writer Tip (Pack of 6) by Mayco ..
AC-227 Medium Writer Tip (Pack of 6) by Mayco..
MB1527 Milk Can Vase in Ceramic Con..
MB1526 Milk Can Bud Vase in Ceramic..
MB1523 Rama Llama Dish - in ready t..
MB1523 Rama Llama Dish in Ceramic Cone 04 Bis..
MB1524 Unicorn Mug in Ready to paint, Ceramic..
MB1524 Unicorn Mug in Ceramic Cone 04 Bisque ..
MB1525 Llama Mug in Ready to paint,..
MB1525 Llama Mug in Ceramic Cone 04..
CG-996 Spring Rain (4 ounce) Jung..
CG-996 Spring Rain (pint) Jungle ..
t in most toolbox or bag. X10285 Short Cut Glaze Brush 3/4 inch By Xie..
SDM0530 Large Raccoon - Cone 04 Ceramic Bis..
SDH1738 Trout - Cone 04 Ceramic Bisque - Han..
35373 Mason Jar Plate - in Ceramic Cone 04 Bi.. Using both a CB-106 #6 Script Liner and a CB-604 #4 Soft Fan, apply three coats of FN-018 Bright Blue to the outside of the mug. Using a CB-106 #6 Script Liner, apply three coats of SC-74 Hot Tamale to the lobster. Using a CB-110 #10/0 Mini Liner, apply one coat of SC-15 Tuxedo to the outline of the lobster. Using a CB-604 #4 Soft Fan, aaply three coats of FN-002 Yellow to the inside of the mug. Add a drop of SC-16 Cotton Tail for the highlight on the eyes. Using a CB-604 #4 Soft Fan apply three coats of FN-039 Light Gray to the outside of the mug including the crab. Once dry, combine approximately 1 oz of SC-32 Bluebeard, 1 drop of dish soap, and 4 oz water into a cup and stir. Insert the straw and begin blowing into the straw to make bubbles. Once the bubbles begin to overflow from the cup, take the mug and press it into the bubbles. This will leave a mark from them as they pop. Repeat until the entire outside of the mug is covered. Using a CB-202 #2 Detail Liner apply two coats of the following colors to the crab: SC-11 Blue Yonder, SC-32 Bluebeard, SC-42 Butter Me Up and SC-74 Hot Tamale. Carmen applied the Hot Tamale around the edges and blended into the other colors as she went inward. Using a CB-604 #4 Soft Fan, apply three coats of FN-004 Red to the inside of the mug. Holding the SL-441 Spots stencil on the lid, working in sections, roll over several times with SC-73 Candy Apple Red before lifting using a 2" foam roller. Move the stencil to different sections to finish the lid. To intensify the dots, use the various sizes of Sponge on a Stick with the SC-73 Candy Apple Red. Using SG-403 Red, dot the fauceted sides of the box bottom and line the inner crease. Brush the outer faucet with 3 coats of FN-51 Strawberry with CB-106 #6 Script Liner. Brush the inside and rim of the box bottom with 3 coats of FN-51 Strawberry using CB-604 #4 Soft Fan. Apply 3 coats of SC-73 Candy Apple Red on the rim and knob of the box lid. Once dry, using CB-604 #4 Soft Fan, Apply 2 coats of S-2101 Crystal Clear Brushing. Stilt the lid and box separately and fire to cone 05/06. 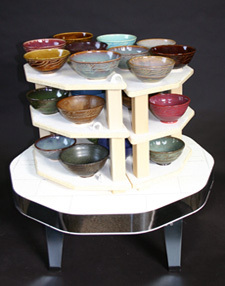 Ceramic Super-store is an on line division of Creative Crafts, inc. Creative Crafts is Louisiana's Largest Wholesale / Retail Ceramic Supplier for Mayco Colors, Duncan Colors, Mayco Ceramic Bisque, Duncan Ceramic Bisque, Hand Cast Ceramic Bisque, Kemper Tools, Xiem Tools, Royal Brushes, Skutt Kilns Laguna Clay, Mackies Casting Slip and more, all under one roof for your complete one stop & shop online ceramic store.